April Black Belt test and Color Belt clinic a Success! The Annual Spring Dan test and color belt clinic (held April 12-13) in Houma, LA has come and gone, but the comradeship and lessons learned live on. Hosted by Houma Tang Soo Do, (Louisiana), nearly 100 students and instructors from all parts of Region 6 were present. 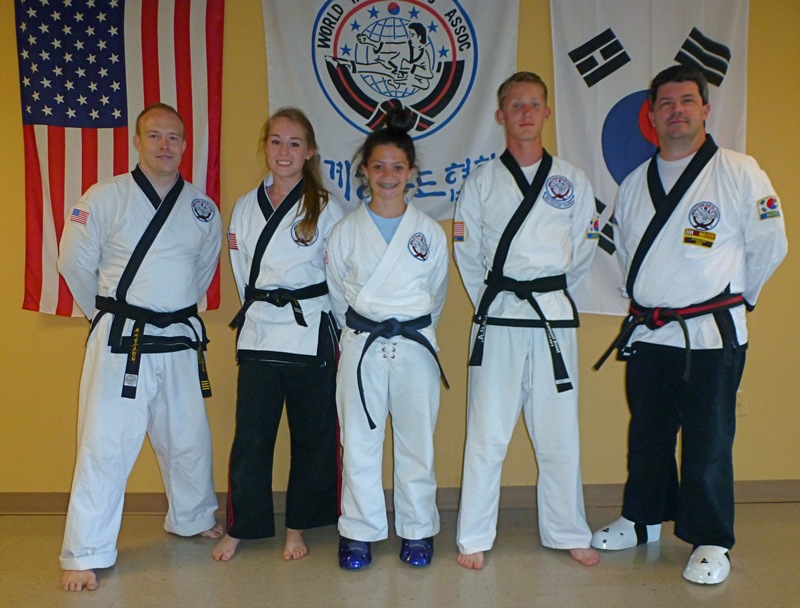 SKC Students testing for black belt or advanced black belt ranks included: Kelsey Strahan (for Cho Dan), Samuel Bond (for E Dan) and Katherine Robinson (for Sam Dan). Best of the test in the Junior division was awarded to Katherine Robinson for her outstanding performance during the three-hour test. The following day, color-belt students gathered to learn a variety of Tang Soo Do skills, including work on Hyungs, weapons and self-defense. The day ended with a wonderful Louisiana-style crawfish boil! Many thanks to Master Lanny Domangue, Mr. and Mrs. Click and all the fine folks at Houma TSD for a wonderful time. Tang Soo! L to R: Master Jason Church, Sam Dan Katherine Robinson, Cho Dan Kelsey Strahan, E Dan Samuel Bond and Master Thomas Strahan. This entry was posted on Wednesday, May 29th, 2013 at 3:34 pm and is filed under Uncategorized. You can follow any responses to this entry through the RSS 2.0 feed. You can leave a response, or trackback from your own site.